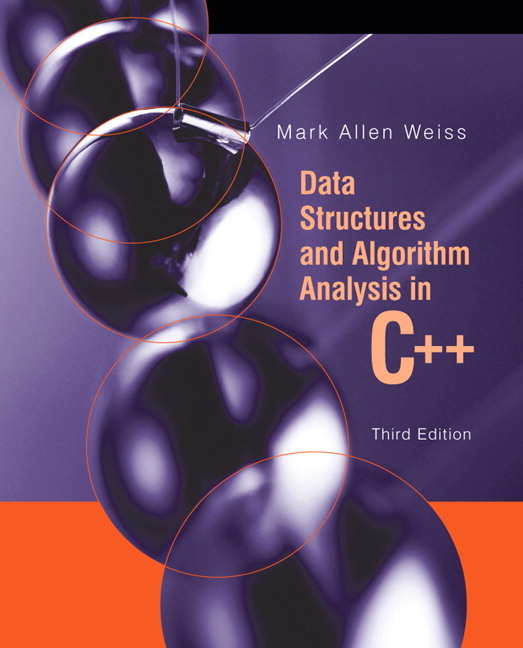 Data Structures and Algorithm Analysis in C++ is an advanced algorithms book that bridges the gap between traditional CS2 and Algorithms Analysis courses. As the speed and power of computers increases, so does the need for effective programming and algorithm analysis. By approaching these skills in tandem, Mark Allen Weiss teaches readers to develop well-constructed, maximally efficient programs using the C++ programming language. This book explains topics from binary heaps to sorting to NP-completeness, and dedicates a full chapter to amortized analysis and advanced data structures and their implementation. Figures and examples illustrating successive stages of algorithms contribute to Weiss’ careful, rigorous and in-depth analysis of each type of algorithm. This text is designed to teach students good programming and algorithm analysis skills simultaneously so that they can develop intricate programs with the maximum amount of efficiency. By analyzing an algorithm before it is actually coded, students can decide if a particular solution will be feasible and see how careful implementations can reduce the time constraint for large amounts of data. No algorithm or data structure is presented without an explanation of its running time. 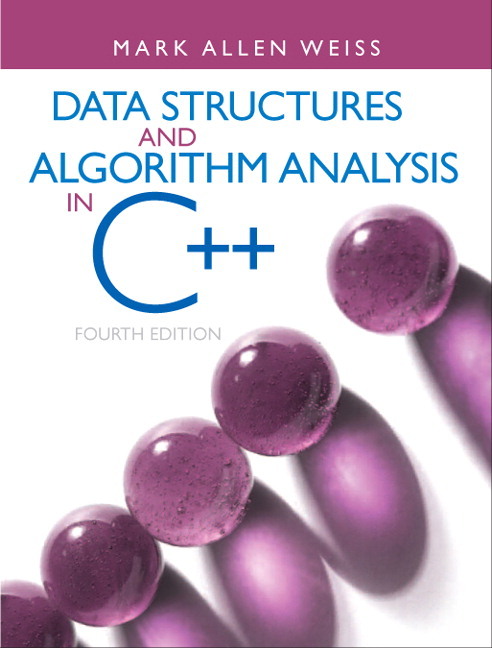 This book is suitable for either an advanced data structures (CS7) course or a first-year graduate course in algorithm analysis. As introductory sequences expand from two to three courses, this book is ideal at the end of the third course, bridging the way to the Algorithms course. Discussion of algorithm and design techniques covers greedy algorithms, divide and conquer algorithms, dynamic programming, randomized algorithms, and backtracking. Covers topics and data structures such as Fibonacci heaps, skew heaps, binomial queue, skip lists and splay trees. A full chapter on amortized analysis examines the advanced data structures presented earlier in the book. Chapter on advanced data structures and their implementation covers red black trees, top down splay trees, k-d trees, pairing heaps, and more. End-of-chapter exercises, ranked by difficulty, reinforce the material from the chapter while providing readers an opportunity to put those concepts into practice. Chapter 4 includes implementation of the AVL tree deletion algorithm–a topic often requested by readers. Chapter 5 has been extensively revised and enlarged and now contains material on two newer algorithms: cuckoo hashing and hopscotch hashing. Additionally, a new section on universal hashing has been added. Also new is a brief discussion of the unordered_set and unordered_map class templates introduced in C++11. Chapter 6 is mostly unchanged; however, the implementation of the binary heap makes use of move operations that were introduced in C++11. Chapter 7 now contains material on radix sort, and a new section on lower-bound proofs has been added. Sorting code makes use of move operations that were introduced in C++11. Chapter 8 uses the new union/find analysis by Seidel and Sharir and shows the O( M α(M,N) ) bound instead of the weaker O( Mlog∗ N ) bound in prior editions. Chapter 12 adds material on suffix trees and suffix arrays, including the linear-time suffix array construction algorithm by Karkkainen and Sanders (with implementation). The sections covering deterministic skip lists and AA-trees have been removed. Throughout the text, the code has been updated to use C++11. Notably, this means use of the new C++11 features, including the auto keyword, the range for loop, move construction and assignment, and uniform initialization.